I decided to write a series of tutorials about Elasticsearch aggregations. In this first post of the series, we are going to deal with the bucket aggregations that allow us to implement faceted navigation. Elasticsearch is an opensource JSON-based search engine that allows us to search indexed data quickly and with options that are not provided by classic data stores. Kibana is a tool mainly allowing visualization of Elasticsearch data. We will use Kibana because it also provides a very convenient way for writing and executing queries (with autocomplete). Before familiarizing myself with the term aggregations in the Elasticsearch world, what I was actually trying to learn was how to implement the widely known feature of facets for my indexed data. Chances are that you know about facets, you have seen it in many sites. They are usually placed as a sidebar in search results landing pages and they are rendered as links or checkboxes that act as filters to help you narrow the results based on their properties. A section of Elasticsearch’s aggregations framework named bucket aggregations provides the functionality we need to implement a faceted navigation. As you can see, we will use Elasticsearch version 6.4.2 in this tutorial. I recommend following the official instructions for installing kibana at your machine’s OS. I followed this guide for installing the product via a repository in Ubuntu. Start the kibana service and navigate to its home page at http://localhost:5601. 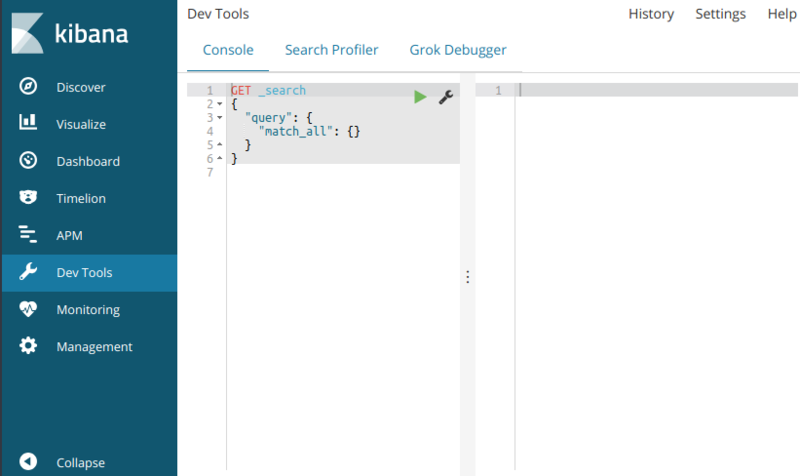 We will heavily use the Dev Tools which is a powerful console talking to the Elasticsearch engine. Don’t be afraid, everything will become very clear once we start playing with the data. Before starting explaining the aggregations, we first have to create the index to store our data and then we have to feed this index with sample data. We created an index with name city_offices with the aforementioned properties. Important note: we chose to define the entity relations as nested objects. Why? Thus, if we wanted to search the index for offices that have a Dentist citizen with age 30, this document would fulfill the criteria even though the Dentist is 35 years old. I have created some sample data with random cities, occupations, pet names etc. You can find it at this tutorial’s GitHub repo. Note: The data were generated with this ruby script. You can alter it as you please and execute it to produce your desired sample data json file. All aggregation queries are embedded in search requests. aggregation name: is the name we give to our aggregation. This is required in order to be able to parse the search response afterwards and locate the specific aggregation results (you will understand this better after we execute the first aggregation request). aggregation type: is the type of the aggregation we want to execute. You can browse all available aggregations provided by Elasticsearch here. aggregation properties: are the available properties specific to the aggregation type. We will use the Terms aggregation in order to find out how many different values our documents have in a specific field. Now execute the request by pressing the play link that you should be seeing given that the query you typed is focused. Since we are executing a search request, the response contains the hits attribute with all the results matching our query (in this case all documents since we didn’t add a query). It also contains though another attribute named aggregations and that’s where our aggregation results fall under. Inside the aggregations you can see our cities aggregation and that’s why it is required to name the aggregations you define. Before explaining the weird sum_other_doc_count 37 value, let’s first examine the buckets. There’s our different values for the city field of the city offices. “Human reading” the values, we have 8 offices in Amsterdam, London, Oslo, Paris, San Francisco and Tokyo, 7 offices in Athens, Barcelona, Chicago and Madrid. The total of these offices is 76 but the search response says we have 113. Let’s subtract the bucket’s office total from the actual total offices: (113 - 76 = 37) == sum_other_doc_count. That’s right. Explanation: the aggregation we defined has another property named size which has a default value of 10. Since we didn’t define another value, Elasticsearch limited the buckets to the top 10 different city values based on their occurrences in the index. 37 are the documents whose cities are not listed in the buckets and NOT the number of the unlisted cities. Let’s change the size to 50 (hoping that we don’t have offices in more than 50 cities). Hint: In addition to defining the aggregation’s size, I also set in the top level query the size to 0 so that I can browse the response faster since the hits attribute will be empty. Perfect. The previously missed cities are now fetched and the sum_other_doc_count’s 0 value confirms that we haven’t left any document outside the aggregation. Let’s add another aggregation for the offices, this time for their type. We defined another terms aggregation named office_types and kept the default bucket size since we know that we don’t have more than 10 distinct office types. So, we have 57 primary and 56 secondary offices and 0 offices left outside the aggregation’s buckets. If we do define a search query along with the aggregations definition, then the aggregations will be applied to the subset of the documents that match the search query. For example, if we want to see how many different office types are in Athens, we can specify the appropriate search query without altering the aggregations’ one. We have 5 secondary and 2 primary offices in Athens. The Terms aggregations (and other type of aggregations) allow the definition of sub-aggregations. The sub-aggregations are executed in the documents belonging to the bucket of the parent aggregation. It’s like asking: Give me the different cities. Ok, now give me for each one how many office types it has. The syntax of sub-aggregations is pretty straight forward. If we wanted to retrieve even more sub-results for another property of the city offices (for example building type), we could add a sub-aggregation inside the already defined office_types sub-aggregation of the cities aggregation. Awesome. Time to play with the pets. As previously mentioned, we defined the city office’s relations as nested objects. In order to perform aggregations on these relations we have to follow another approach, the Nested aggregations. where nested-object-path is the navigation path of the desired object in the root document. For example, if we want aggregations for the citizens we will set this property to citizens. If we wanted aggregations for the pets, we will set this property to citizens.pets. Let’s see how we can breakdown the number of citizens per occupation. So, there are 3966 citizens that have registered their pets to our city offices of which 243 are Hairdressers, 241 are Microbiologists etc. Mind the field definition of the nested Terms aggregation in the query. It has to be the full path of the nested object. Ok good, but what if wanted to see in how many offices are these citizens registered. In other words, how many offices have Marketing Managers? How many offices have Librarians? We have to use another type of aggregation, named Reverse nested aggregation. Even though it might sound complicated, it’s not. And playing around with the data is the best way for understanding the provided functionality of any feature. As you can see, the reverse nested aggregation is always defined as a sub-aggregation inside a nested aggregation. Time to see in how many offices each occupation is spread. Translating the response, we have 243 Hairdressers registered in 98 offices, 241 Microbiologists registered in 98 offices, 234 Farmers registered in 99 offices etc. The reverse nested aggregation accepts a single option named path. This options defines how many steps backwards in the document hierarchy we want Elasticsearch to go to calculate the aggregations. In our case, since citizens is the immediate relation of the city office type we had to leave it undefined implying that we want the aggregations of the occupations to be calculated against the root object a.k.a. the offices. Confused? Don’t worry, it will become clear after playing around with the pets. Now. How many pets per kind are registered per citizen? So, there are 2421 registered dogs, 2403 registered hamsters, 2380 registered cats etc. The per_citizen bucket info though doesn’t seem right. Does the 113 number ring a bell? Exactly, that’s how many offices we have. Since we didn’t define the path in the reverse nested aggregation, Elasticsearch calculated the count of root documents (a.k.a. the offices) that have each pet kind registered. Let’s fix that. There are 2421 dogs registered by 1864 citizens, 2403 hamsters registered by 1852 citizens, 2380 cats registered by 1823 citizens etc. Note: Each citizen has more than one pets which can be of different kind that’s why the per_citizen sum of doc_count is way bigger than our citizens. For each city, how many kind of pets are registered per citizen occupation and in how many offices? Since we want to have results per citizen occupation, we are going to add a Terms sub-aggregation on the field occupation. Since we want to have results per pet kind, we are going to add a Terms sub-aggregation on the field kind. I will end this tutorial with something easier. Global aggregations. It would be better if we could render the previous form with disabled checkboxes for the terms that are no longer valid. We could accomplish that if we had the aggregation results of a search request without a query and compared them with the search request that was triggered after user narrows the results by clicking on a checkbox. To avoid executing an additional search request, we can use the Global aggregation. Now, in the response we have an unfiltered section which we can use to render the form as we please. You may find the script generating random data and the already generated sample data here. You can submit your feedback or any comments you may have here. That’s all! Bucket cat photo.